Metro Silver Metal Flake films are designed to give a brilliant Holographic look with an outdoor rating of up to 5 years. Available in 6 colors. Metro Purple Metal Flake films are designed to give a brilliant Holographic look with an outdoor rating of up to 5 years. Available in 6 colors. Metro Red Metal Flake films are designed to give a brilliant Holographic look with an outdoor rating of up to 5 years. Available in 6 colors. Metro Blue Metal Flake films are designed to give a brilliant Holographic look with an outdoor rating of up to 5 years. Available in 6 colors. Metro Orange Metal Flake films are designed to give a brilliant Holographic look with an outdoor rating of up to 5 years. Available in 6 colors. 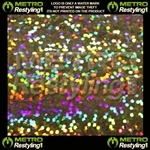 Metro Gold Metal Flake films are designed to give a brilliant Holographic look with a outdoor rating of up to 5 years. Available in 6 colors.